Time is a very complex subject. We’ve devised a system of measuring the movement of the sun and moon and then broke all that down to years, months, days, hours, minutes, seconds and even smaller. But what is it really? 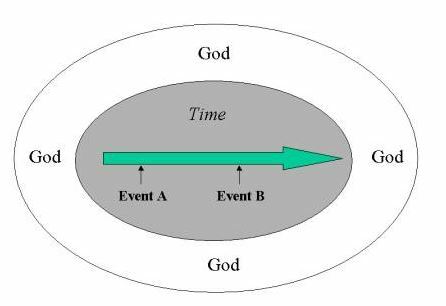 Wikipedia says, “Time is a dimension in which events can be ordered from the past through the present into the future,] and also the measure of durations of events and the intervals between them. Time has long been a major subject of study in religion, philosophy, and science, but defining it in a manner applicable to all fields without circularity has consistently eluded scholars. Nevertheless, diverse fields such as business, industry, sports, the sciences, and the performing arts all incorporate some notion of time into their respective measuring systems. Some simple, relatively uncontroversial definitions of time include “time is what clocks measure” and “time is what keeps everything from happening at once.” Newton argued that time is simply a sequencing of events. Leibniz said it’s a non-entity. Every discipline uses the measurements of time in some way and we all live every day (time?) in it, but it’s something we can’t really completely understand. In Ecclesiastes 3:1-8, the word “time” shows up 28 times. There are 14 pairs of opposites and each has its own “time.” There’s a time to be born and a time to die. There’s a time to plant and a time to harvest. There’s a time to kill and a time to heal. There’s a time to weep and a time to laugh. There’s a time to grieve and a time to dace. There’s a time to gain and a time to lose. There’s a time to save and a time to spend. There’s a time to tear and a time to mend. There’s a time to speak and a time to listen, there’s a time to love and a time to hate. There’s a time for war and a time for peace. We really don’t have to understand the scientific explanation of what time is to grasp what Solomon is telling us. We all live it and at one level or another we all understand. There is a time for every purpose “under heaven.” In the first two chapters Solomon talks about life “under the sun” but here it’s “under heaven.” We all know who’s in heaven. We are often taught to pray to God, “our father who art in heaven…” All events under heaven are ordered by the God who’s in heaven. Psalm 33:13-14 says, “The LORD looks down from heaven and sees the whole human race. From where he rules, he looks down on all who live on earth.” God is sovereign over all the affairs of my life. When I find myself facing tough times or confusing situations or fear and uncertainty, I try to relax under God’s watch care. Isaiah encourages us to “wait” for God who will renew our strength at the right time. When David was running and hiding from Saul who swore to take his life, David wrote, “I trust in you, O Lord …my times are in your hands” (Psalm 31:14-15).